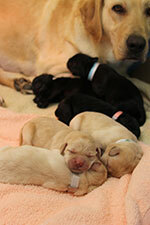 A Lab mom watches over her sleeping newborn puppies. All Seeing Eye puppies get their start at The Seeing Eye’s state-of-the-art breeding facility located in Chester, N.J. Staff monitors the dogs and puppies 24/7, and along with volunteers, ensure that the breeding dogs and puppies are exposed to all the care, love and affection they can handle! The breeding station is separate from the main location in Morristown in order to ensure the health and safety of the breeding colony and puppies. Opened in 2002, the entire facility is constructed and managed with one goal: to provide an atmosphere most conducive to a healthy upbringing and positive early experience for the puppies, and to providing a healthy, active lifestyle for the adult dogs. The Seeing Eye is the only guide dog school to maintain such a facility, which has resulted in a significant increase in the success rate of Seeing Eye puppies who become guides, and a safe environment for expectant moms and newborn puppies. A golden retriever in a kiddie pool is fishing a tennis ball from the water, while a black Lab shakes water all over her. Our breeding dogs are taken for daily walks around the scenic grounds and form special relationships with the staff members who tend to them. Each dog has a roommate in their spacious kennels and regularly engages in group play in a large yard where games of fetch, tug-of-war, and keep away are regular and popular occurrences. In a separate agility yard, staff train their dogs to run an obstacle course with jumps, tunnels, weave poles and more. In addition, the dogs are all trained to perform fun tricks and the basic manners, which were learned from their puppy raising families, are reinforced. To keep their skills sharp, each dog and their staff partner work towards passing The Seeing Eye Canine Excellence Challenge. In preparing their charges for the test, each staff member provides physical and mental challenges to keep the dogs happy and engaged, and also instill manners that will help adjust to their new homes when they retire from breeding. A newborn shepherd puppy sleeps while snuggled close to mom and siblings. Puppies are born at the breeding station and only reside there for a short while, but by the time they leave for their puppy raising homes at seven weeks of age, our puppies have experienced more than most pet dogs will experience in their first year of life. From the first moments of life, staff members and volunteers hold, pet and play with the puppies. Every effort is made to expose the puppies to as many sights, sounds and surfaces as possible. Vacuum cleaners, strollers and mannequins are just a few of the things used to familiarize the puppies with every day sights and sounds. Starting at four weeks, puppies make frequent trips to a special play room, a stimulating environment that’s filled with fun toys, various tactile surfaces, small stairs and more. A CD plays thunderstorms, sirens, babies crying, noisy crowds and other sounds from the outside world. Volunteers and staff wear funny hats, glasses and other accessories to desensitize the puppies. Puppies are introduced to a collar and leash so the experience is not unfamiliar or stressful when they meet their puppy raisers. A German shepherd races out of an agility tunnel with a breeding station staff member running along side. The Seeing Eye breeds its own dogs for the program: German shepherds, Labrador retrievers, golden retrievers and a cross of the Lab and golden retriever. Female dogs retire at age four and male dogs sire eight to 10 litters before they are adopted by a loving family. The science behind canine genetics, breeding, disease control and behavior, directs a Seeing Eye puppy towards his or her special destiny before conception even occurs. Much of our research is driven by the fact there is no “perfect Seeing Eye® dog.” Variations in temperament, size, strength, stride, and energy are characteristics that must be closely matched to create a successful partnership. From developing a computer information system that calculates the suitability of every dog in the colony to become a breeder, to funding cutting edge DNA research, The Seeing Eye is the leader in building, if not the “perfect dog,” then certainly the most healthy, productive, predictable, and reliable guide dogs possible.